The recent news of the near-bankruptcy of UK-based Cooperative Bank and Portugal-based Banco Espirito Santo made me question the utility of regulatory capital requirements. What are they for? Is raising them actually that useful? It looks to me that the current conventional view of minimum capital requirements is flawed. In the pre-crisis era, banks were required to comply with a minimum Tier 1 capital ratio of 4% (i.e. Tier 1 capital/risk-weighted assets >= 4%). Most banks boasted ratios of 2 to 5 percentage points above that level. Basel 3 decided to increase the Tier 1 minimum to 6%, and banks are currently harshly judged if they do not maintain at least a 4% buffer above that level. Indeed, given the possible sanctions arising from breaching those capital requirements, bankers usually thrive to maintain a healthy enough buffer above the required minimum. Sanctions for breaching those requirements include in most countries: revoking the banking licence, forcing the bank into a state of bankruptcy and/or forcing a restructuring/break-up/deleveraging of the balance sheet. Hence the question: what is the actual effective capital ratio of the banking system? Companies – as well as banks in the past – are usually deemed insolvent (or bankrupt) once their equity reaches negative territory. At that point, selling all the assets of the company/bank would not generate enough money to pay off all creditors (while shareholders are wiped out). Let’s assume a world with no Tier 1 capital but only straightforward equity, and without regulatory capital requirements. Following the basic rule outlined above, a bank with a 10% capital ratio can experience a 10% reduction in the value of its assets before it reaches insolvency. Let’s now introduce a minimum capital requirement of 6%. The same bank can now only experience a 4% reduction in the value of its assets before breaching the minimum and be considered good for resolving/restructuring/breaking-up by regulators. For sure, higher minimum requirements have one advantage: depositors are less likely to experience losses. The larger the equity buffer, the stronger the protection. However, there are also several significant disadvantages. Raising the minimum threshold does little to protect taxpayers if regulators believe that a bank should be recapitalised, not when its Tier 1 gets close to or below 0%, but when it simply breaches the 6% level. In such case, it might have been possible for the bank’s capital buffer to absorb further losses without erasing its whole capital base and calling for help. 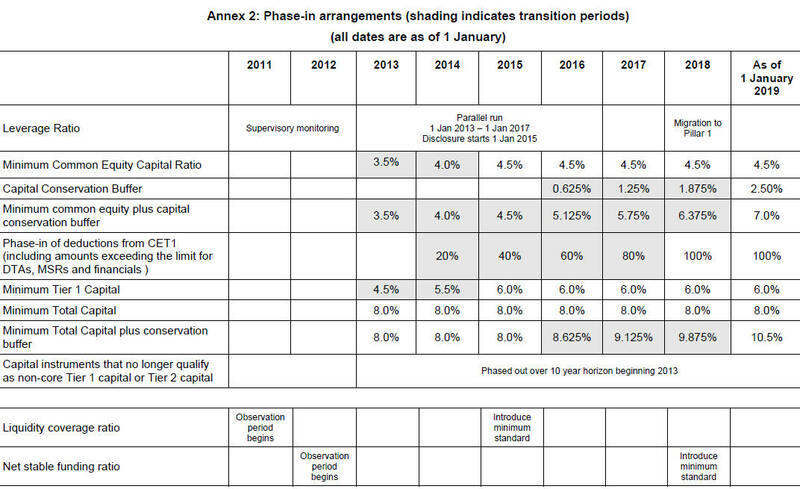 For instance, Espirito Santo’s regulators said that its recapitalisation was compulsory: it reported a 5% equity Tier 1 ratio, below the 7% domestic minimum. And the state (i.e. taxpayers) obliged. But… It still had a 5% equity buffer to absorb further losses. Perhaps this would have been sufficient to absorb all losses and spare the taxpayers (perhaps not, but we may never find out). When approaching the minimum requirement, bankers are incentivised to start deleveraging in order to avoid breaching. Alternatively, they can be forced by regulators to do so. This has negative consequences on the availability of credit and on the money supply, possibly worsening a crisis through a debt deflation-type bust in order to comply with an artificially-defined 6% level. While depositors’ protection can be improved, it isn’t necessarily the case of other creditors, especially in light of the new bail-in rules that make them share the pain (so-called ‘burden-sharing’). Those rules kick in, not when the bank reaches a 0% capital ratio, but when it breaches the regulatory minimum (see here). Reaching the minimum requirement can also be self-defeating and self-fulfilling: fearing a bankruptcy event and the loss of their investments, shareholders run to the exit, pushing the share price down to zero and… effectively bringing about the insolvency of the bank. This doesn’t make much sense when a bank still has a 6% capital buffer. Espirito Santo suffered this fate until trading was suspended (see below). So what’s the ‘effective’ Tier 1 capital ratio? Well, it is the spread between the reported Tier 1 and the minimum regulatory level. A bank that has an 8% Tier 1 under a 4% requirement, and a bank that has a 10% Tier 1 under a 6% requirement have virtually* the same effective capital ratio: 4%. Regulatory insolvency events also cause operational problems. Espirito Santo was declared insolvent by its regulators but… not by the ISDA association! Setting regulatory minimums at 5% or 25% would have no impact on the issues listed above, as long as this logic is applied. To make regulatory requirements more effective, sanctions in case of breach should be minimal or non-existent in the short-term but should kick in in the long-term if banks’ capitalisation remains too low after a given period of time. [Minimums are bad] when legally and compulsorily imposed. In a sensitive state of the English money market the near approach to the legal limit of reserve would be a sure incentive to panic; if one-third were fixed by law, the moment the banks were close to one-third, alarm would begin, and would run like magic. And the fear would be worse because it would not be unfounded—at least, not wholly. If you say that the Bank shall always hold one-third of its liabilities as a reserve, you say in fact that this one-third shall always be useless, for out of it the Bank cannot make advances, cannot give extra help, cannot do what we have seen the holders of the ultimate reserve ought to do and must do. Very nice analysis! I wonder if the minimum requirement should be considered obsolete. It may have been valid a century or more ago when banks had trouble borrowing to meet demand for cash. That’s not a problem today. Seems to me that the best thing for banking, short of free banking, would be getting rid of federal insurance and letting people buy private insurance on their deposits against their bank defaulting. Insurance companies could set premiums based on the riskiness of the bank. What do you think of free banking? Selgin and White have convinced me but I would value your opinion. Are you going to post this on the Austrians in Finance group on LinkedIn? I hesitated for a while between 100%-reserve banking and free banking, but I now mostly agree with free bankers. No I won’t post that one on the Linkedin group. I usually post links that are closer to Austrian interests.